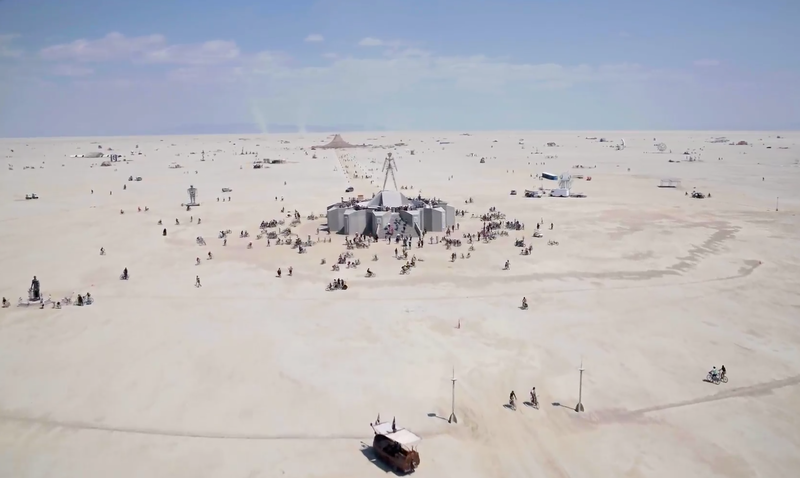 On Monday, the Burning Man Webcast team shot some amazing high-res footage of this year's Burning Man using a drone. It starts facing the Man itself and then flies over and around it. Then it flies over to the Temple, which is still in construction, and then it spins around so we can see the city itself. The footage is really quite stunning! The webcast's producer Matthew Reyes played it on the Burning Man Live Stream (and may do so again) and, while I can't share the video footage, I did get permission to share some of the screenshots I grabbed. Seriously, if you don't want to see this year's city, this is where you turn back now. This year, I'm arriving late and leaving late. Normally, I arrive early and leave early. This will be the first time I've seen the actual Burn since 1996 and it will be the first time I've ever seen the Temple Burn. This footage got me super excited to be there!